The combination of erythromycin and rifampin has been the treatment of choice for Rhodococcus equi infections in foals for many years. Erythromycin is a macrolide antibiotic. It works by inhibiting the production of protein by susceptible bacteria. At the usual therapeutic concentrations, erythromycin is bacteriostatic and has a relatively narrow spectrum (including R. Equi). Rifampin is an antibiotic that is used in combination with erythromycin. Rifampin penetrates abscesses and most body-tissues including bone and CNS. This property makes rifampin particularly useful to treat R. equi because one of the major problems associated with these infections is abscess formation. Rifampin always should be used in combination with another antibiotic because when rifampin is used alone, the bacteria are rapidly able to develop resistance. Rifampin can be either bactericidal or bacteriostatic depending on the specific organism and the concentration of the drug. Infection due to R. equi generally is thought to be the most-severe bacterial pneumonia in foals. In addition to respiratory disease, R. equi can cause gastrointestinal disease and, less commonly, infections of the growth plate. R. equi infections can be both difficult to diagnose and to treat. The disease can progress sub-clinically until the foal presents as a life-threatening emergency due to overwhelming infection and widespread abscessation. Fatalities can occur even with prompt diagnosis and treatment. The two most-common side effects seen in foals due to erythromycin are mild to moderate diarrhea and hyperthermia. Occasionally the diarrhea is enough of a problem to require a change in antibiotic therapy. Foals on erythromycin are very sensitive to heat and possibly to bright sunlight. The mechanism of this hyperthermia is unknown but it is potentially fatal. Erythromycin generally is not used in horses one year of age or older. Severe, potentially fatal diarrhea can occur in these animals. Side effects due to rifampin are rare in the horse. In other species signs of GI pain, rashes, and increased liver enzymes have been reported especially with long-term use. Rifampin should be used with caution in animals with decreased liver function. Rifampin can cause a harmless orange or red discoloration of urine or other bodily fluids. 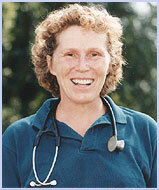 Most R. equi infections occur in the hot, dry weather, making managing hyperthermia difficult. Many veterinarians do not turn out foals on erythromycin in the daytime and may severely limit their turnout time in general. Should hyperthermia occur, aggressive cooling using water, fans, or air conditioning may be helpful. Although very rare, serious and potentially fatal diarrhea has been reported in mares whose suckling foals are on erythromycin. Extra care should be used to minimize or prevent any exposure to the mare. The water buckets and the foal's skin are common sources of exposure. Erythromycin generally is not used with chloramphenicol or penicillin antibiotics. Erythromycin can delay clearance of the bronchodilator aminophylline to the point of potential toxicity. Rifampin may increase the metabolism of some drugs that also are metabolized by the liver including chloramphenicol, corticosteroids and anticoagulants. None of these drugs are likely to be used with EES/rifampin to treat R. equi. Overdose of erythromycin can cause severe GI side-effects. Overdose of rifampin would increase the likelihood and severity of the previously mentioned side-effects.